Hindu worship, whether in the temple or the home shrine, involves a rich and sensual sequence of offerings to the Divine, followed by a series of reciprocal gifts of grace from God to the people. 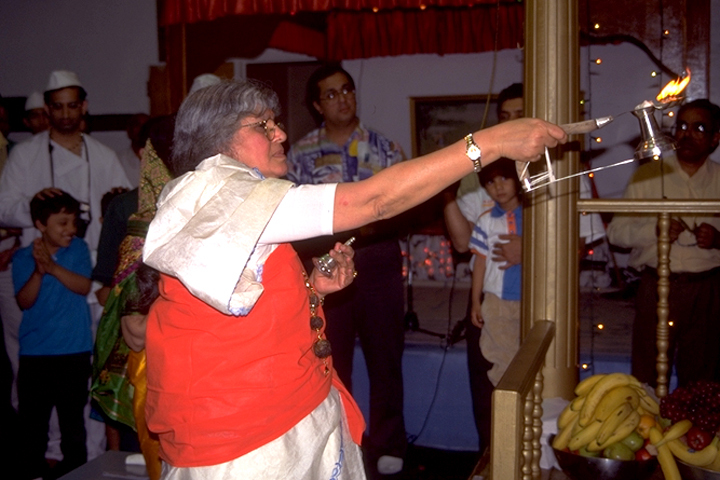 The most general term for worship is puja, and there are specific times during the week when a full puja to the various deities in an American temple will take place. 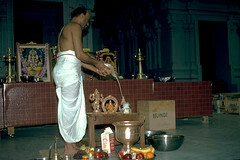 Most pujas, however, are offered whenever people come—individually, as couples, or in small groups of family and friends. At the Hindu Temple of Greater Chicago, sitting atop a hill in Lemont, Illinois, a priest explains the offerings made to the Divine in puja. They represent the five elements of the universe: earth, water, space, wind, and fire. The earth and all that grows in it is offered as fragrant sandalwood paste, fruit, and flowers. Water is offered for drinking and bathing. Space is filled with the sound of mantras and chants, the ringing of the bell. Air or wind is offered as incense, wafted before the image of the Deity. Finally, fire is offered in the form of the oil lamp offering called arati. This final offering is circled carefully and attentively to illumine each part of the face and body of the Deity. So important is this lamp offering that the term arati is often used more generally to refer to the worship as a whole. All these gifts are returned as blessings to those who have come. The blessings distributed to the people are called prashad, literally God’s “grace.” The priest moves among the people, distributing the water that has been offered to the Divine. He ladles a small spoonful of the holy water into the cupped hands of each person, who sips it gratefully and touches the drops that remain in the palm to the forehead, eyes, or hair. The priest distributes to worshippers the bananas, flowers, and apples that have been presented for the Lord’s pleasure. These too are considered prashad, the blessed gifts of God. Finally, the priest offers the worshippers the oil lamp which has illumined the face of the Divine. As he moves among them with the lamp, each person passes a hand through the flame, brushing the blessings of the flame toward herself or himself. Hindu worship is not generally congregational, but a large group will come especially for the abhisheka, the ritual bathing of one of the Deities. 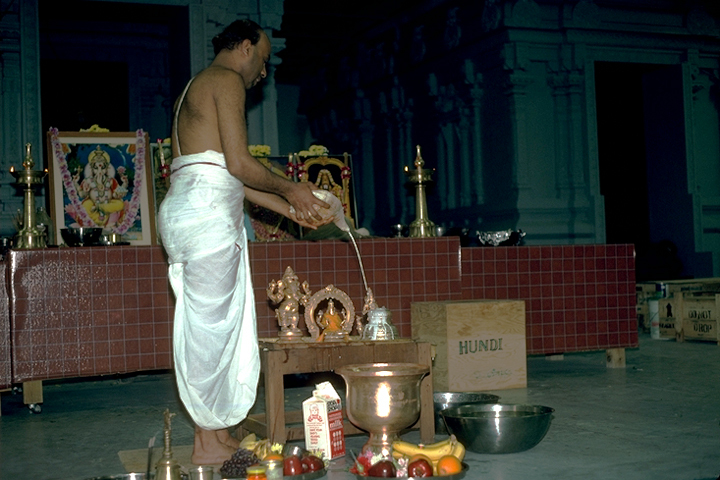 In many American temples, the abhishekas of the central Deities are performed on Saturday or Sunday because of the dominance of the “weekend” schedule in the United States. In these elaborate rites, the images are bathed in water, turmeric, honey, yogurt, and milk. The curtain of the inner sanctum is then drawn, while the Deities are dressed and decorated. When the chamber is opened once again, the crowd gathers for darshan, the auspicious sight of the Divine. Every Hindu puja begins with the praise of Ganesha, the Lord of beginnings, the Lord of the threshold, and the remover of obstacles. Ganesha we bow to you, We bow to you Ganesha.